Every week I create a new soup, test it out and write about it. I recently tried a version of this soup at The Farm on Adderley, a farm-to-table restaurant in my neighborhood. I love lentil soup and was really excited to try their version that also included braised kale, parmesan cheese and a poached egg. Instead of using regular lentils, I added red lentils along with some onions, garlic, rosemary, pepper, kale and the egg - which made a creamy and rich soup that wasn't quite the same as the Farm's but was still a delicious take on their recipe. Making this soup also allowed me to poach an egg, a basic cooking technique that I never tried before. I followed the step-by-step instructions on Serious Eats and like many of the soup recipes that I have tried on this site, I realized how easy it was. With our without an egg, this soup is an easy variation on the classic soup recipe thanks to the hearty kale and the creamy parmesan. Add water to a pot and start boiling. Cut up the onions and garlic and add them to the pot, along with the lentils. Add the parmesan, rosemary, thyme, bay leaves, salt and pepper and let cook for 20-30 minutes, checking on the soup periodically and adding water (if needed). Add the kale and let cook for another 10 minutes. Taste and turn off the flame. Set aside while the egg is poached. Read this article on how to poach an egg. Top the soup with some parmesan cheese and the egg. Enjoy! 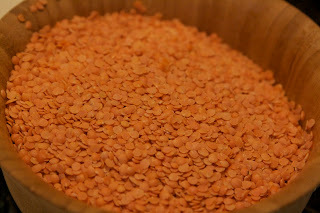 How do you make your lentil soup? 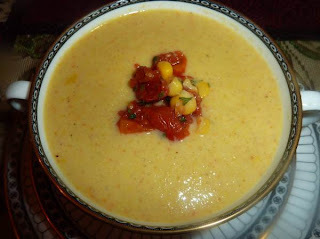 Bring a taste of summer to the winter table with this soup celebrating the great flavors of corn and tomato together. Through the summer this combination is common to all areas of the country, so if you miss the combination I think this will satisfy those taste buds that are craving the magnificent pairing. 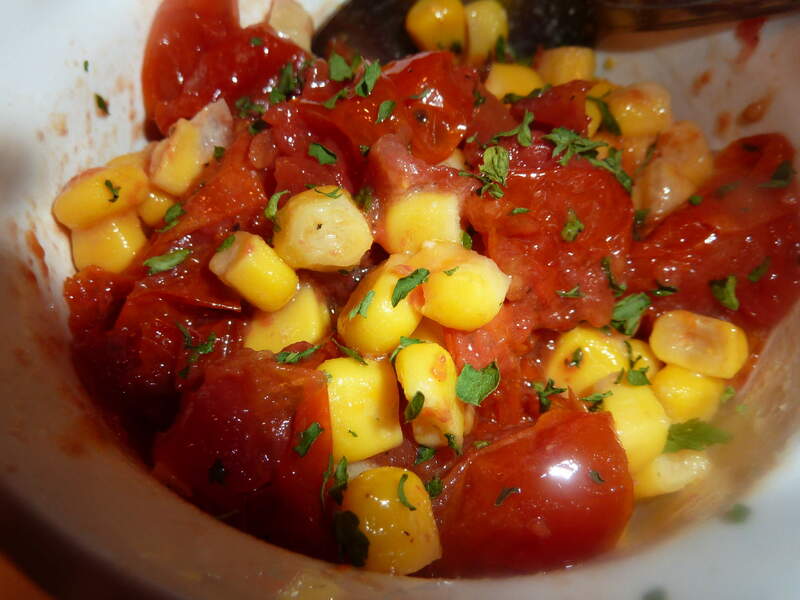 To read more recipes by Kathleen, be sure to check out her blog, "Deja Vu" Cook. Do you have a soup that you would like to contribute to Seriously Soupy? Email me at seriouslysoupy@gmail.com for more details! With the temps dropping into the single-digits I have definitely been taking refuge by making soups. FoodieLink, a website that focuses on healthy food, good eating and long-term sustainability and myself have paired up to sponsor a Soupbowl Winter Soup Contest. Contestants - both amateur chefs and professionals - are asked to submit their favorite soup recipe (using at least one locally-sourced ingredient) to compete in a live soup cook off at Jimmy’s No. 43 in January. Members of the FoodieLink community will have a chance to vote for their Top 10 favorite soup recipes. Contestants will then be asked to compete on January 26th in a live-judging/all-you-can-eat soup taste tasting event. The grand prize winner will be featured on FoodieLink along with exciting prizes for the second and third place soup recipes. A quarter of the proceeds will go to the Bowery Mission, a non-profit soup kitchen in NYC. TICKETS for this fundraiser and all-you-can-eat soup party costs $30/per person and includes bread from Orwasher’s Bakery, regional cheeses, and the chance to get to know good foodies including NYC food professionals. Soup recipes are free to enter and the top 10 contestants will attend the event for free. 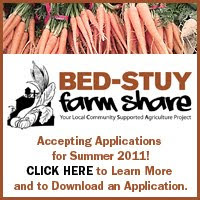 To enter your soup recipe, please fill out this form on FoodieLink. To learn more about this exciting winter soup contest, please visit FoodieLink. A few months ago I learned about some soups from South America and was excited to learn about locro, sopa de sorrel and Ajiaco Bogotano - a chicken and potato Soup from Columbia. Considered Colombia's national dish, I discovered another recipe for chicken and potato soup in the January 2011 edition of Real Simple magazine that included corn, lime juice, celery and potatoes. Topped with avocado and cilantro (optional), this delicious comfort food was also an easy and quick soup to prepare that used minimal spices (lime, oregano, salt, and pepper). A great variation on the chicken soup and one that will have you wanting more. Enjoy! 1. In a large saucepan or Dutch oven, combine the chicken broth and 1 cup of water and bring to a boil. Add the chicken and corn and simmer until the chicken is cooked, 10 to 12 minutes. 2. Remove the chicken and corn from the saucepan and reserve. 3. Wipe out the saucepan and heat the oil over medium heat. Add the onion, celery, and garlic and cook, stirring occasionally, until beginning to soften, 2 to 3 minutes. Add the potatoes and the reserved cooking liquid and bring to a boil. Reduce heat and simmer until the potatoes are cooked through, 15 to 20 minutes. 4. Meanwhile, shred the chicken and cut the corn pieces into 1-inch thick rounds. Return the chicken and corn to the soup. Add the lime juice, oregano, salt, pepper and cook until heated through, about 1 minute. Serve the soup with avocado, cilantro, capers, or lime wedges. What soups have you made from Columbia? Sometimes it takes a little inspiration to create a new soup. I was perusing through "Great Tastes Soup" by Bay Books and discovered a delicious-looking chickpea, potato and spinach soup and an interesting tomato soup that included celery stalks and carrots. I decided to combine aspects of the two to create this creamy tomato soup with chickpeas and spinach by adding some simple flavors like rosemary and thyme and omitting the potatoes, sugar, and bay leaves. A classic recipe that can continuously be altered - and that is the beauty of soups. Cut up the onions - both yellow and green - and place them in a medium-sized pot, along with the garlic and olive oil. Cover and let cook for 10 minutes as you cut up the tomatoes, celery, and carrots. Add them to the pot, along with the paste, rosemary, thyme, salt, pepper and some water (use your discretion). Cover and let cook for 30-40 minutes. When the vegetables are soft, turn off the flame and mix the ingredients together in a blender with the cream. Return to the pot and add the spinach and chickpeas. Let cook for another 5 minutes. Taste with salt and pepper and top with Parmesan cheese. Enjoy! What are your favorite recipes for tomato soup? Happy Hanukkah (or Chanukah)! This eight-day Festival of Lights revolves around spending time with family and friends, playing games like the drediel, lighting the menorah, and enjoying delicious foods like latkes, "sufganiyot" (jelly-filled doughnuts), and brisket. Being a winter holiday, it is also perfect to enjoy soups - ranging from the traditional matzo ball soup and cabbage soup to new variations such as a beef and braised beef soup. Enjoy the holiday and the soup! Fill up a pot with water and bring to a boil. Add the chicken and cover. While that is cooking cut up, tie the thread around the dill and parsley, and the clean the vegetables. When the water/chicken starts to boil, clean any bubbles or dirt that acclimates to the surface. Add all of the vegetables and the salt to the pot. Set to a very low flame and allow the water to simmer slowly for two hours. Periodically check the pot and taste the concoction, adding salt if needed. After three hours let the vegetables sit in the pot until they cool. Discard all vegetables except carrots. Depending on when you are making the matzo meal you may need to keep your broth in the fridge or remove the vegetables and place the pot immediately back on the heat as the matzo balls are added. In a medium-sized bowl mix eggs and oil with a fork, but do not beat the mixture. Add the matzoh meal, salt, seltzer, and mix together. Cover with aluminium foil and place in the refrigerator for 20 minutes. Start your pot of broth again and bring it to a slight boil. After 20 minutes remove the matzoh from the fridge and wet hands. Make the balls and place them in the boiling pot. Lower the flame, cover, and cook for 40 minutes. Remove the matzoh balls and broth with a spoon, place into a soup bowl, and enjoy! 2. Sweet-and-Sour Cabbage Soup - A recipe from cookbook author, Lisa Yockelson, this brisket and cabbage soup includes raisins, cabbage and beef for a tasty soup that can also be enjoyed throughout the year. The post also includes a soup recipe for a potato and dairy soup. 3. Apple and Parsnip Soup - A perfect pairing with your potato latkes, this simple parsnip and soup includes Granny Smith apples, coriander, olive oil, onions and parsnip. Also a quick and light treat any time of the year. 4. Mushroom Barley Soup - A classic soup that is also a delicious treat for Hanukkah. The recipe includes pearl barley, mushrooms, celery, and tomatoes that is said to cook under an hour! 5. Beet and Braised Beef Soup - Featured on Epicurious, this beet and beef soup is a hearty soup for the holiday that includes lima beans, carrots, beef ribs, beef, celery root, beets and cabbage. The flavor combination of dill, scallion and red wine vingear that Peter Hoffman (creator of this soup) says would be paired well with a "well-dressed salad of fall greens and great rye bread." The recipe also includes a tutorial on how to choose the meat for the soup. Last month, I was asked by a well known chef to make a soup, pair it with wine, and then tweet about it. At first I thought it would be a difficult feat. But after thinking about it I realized that pairing soup with wine is like pairing any other meal with wine. Let’s take a steak dinner. On the plate are some veggies, mashed potatoes, and then the steak. When picking out the wine for that plate we mainly focus on the wine though we do take into consideration the side dishes. Soup is similar to this. It’s basically a plate of food in liquid form. So, when pairing the most important thing is to focus on the main flavors. Chicken, spice, mushrooms, whatever it is..and figure out which wine will go with those flavors. Of course the best pairing is that you drink wine you like with food that you like! 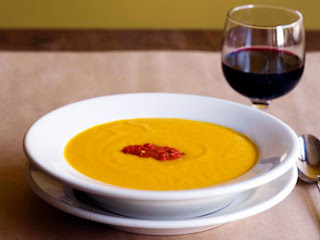 A naturally sweet soup, butternut squash works well with this Spann Vineyards Chardonnay - a crisp, refreshing and food-friendly wine. Containing black fruit aromas such as black cherry, plum and cassis with hints of pomegranate, this Cabernet works well with the rich and hearty beef in this soup. The wine is also described as being "full on the palate" whose complex tastes include "cured meats, floral notes and shaved dark chocolate leading to a long cedar, black fruit and mocha finish." A delicious addition to mix up a typical Turkey Soup, this seasonal delicacy pairs well with the fruity notes in this wine. A pungent soup generally made from beef stock, French Onion Soup and its rich gruyere cheese is a classic that pairs well with wine from New Zealand. Described as having a "deep, rich color with a concentration of flavors." This wine works well with the rich flavors of this soup. A creamy and velvety soup, Potato and Leek Soup pairs well with Spelletich Chardonnay, a wine from Napa Valley. Described as containing "hints of lavender and caramelized apricots lead into a perfectly balanced mouth feel with a tantalizing soft hint of cream" this complex blend balances well with this earthy and flavorful soup. A classic soup recipe that is not only a hearty meal but mom's choice as a natural cold elixir. Broman Cellars' Savingnon Blanc is the perfect pairing with this soup that features a vibrant blend of citrus fruits (grapefruit, lemongrass and lime zest) and some white peach and apricot. The tomato sauce version, Manhattan Clam Chowder combines the perfect blend of fresh clams, celery, onions, pepper, and potatoes. The Tool Box Pinot is balanced with fresh green apple, bright citrus and clean mineral flavors" that provides a crisp and satisfying finish when paired with a fish-based soup. A hearty vegetable soup with red beans, macaroni pasta, carrots, tomatoes, zucchini and much more is an easy and quick soup recipe that pairs well with Spotted Owl Alexandria’s cuvee, a wine that is not produced every year. This unique varietal is reminiscent of a Syrah as well as aromas of dark cherry, blackberry, mulberry, and spice. A traditional Chinese dish, pork wonton soup is a delicious combination of vegetables and pork broth that pairs well with a Halleck Dry Gewurztraminer, a wine from the Russian River Valley. Containing "deep lychee, pineapple, rose petals and magnolia," this complex wine is said to leave a "long cleansing finish." A wine that contains notes of white pepper, spice, vanilla and blueberry that complements the smoky flavors of the sausage (or chirzo), hearty beans and rich flavors in the kale. One of my favorites, Lentil Soup is classic comfort food that also happens to be healthy. This Renard Roussanne, a chardonny from Santa Barbara, is a complex blend featuring "almond blossom, nectarine, apricot and honeycomb as well as accents of melon and mint. Said to have a "lasting finish," this wine can enhance the flavors in the lentils and make for a luxurious meal. Small Wine Lots is a boutique company that focuses on smaller lost wineries in order to connect the wine enthusiast to a winery and to make sure they have fun while doing so. Small Wine Lots hosts wine events, provides tours to wineries, hosts dinners with their Sommelier and has a wine club. To learn more about Small Wine Lots, please call (707) 501-7954, email info@smalllotsbigwines.com or visit their website: Small Wine Lots. Copyright © 2009-2011 Seriously Soupy.